What concerns you about your future? Have you shared these concerns with your children? At this point in your life, what does peace of mind mean to you at this stage of your life? How is it different from what you might have said ten or 20 years ago? Is it your plan to stay in your home for the long term? Why or why not? What’s most important to you about that? What are some of the contingencies that we need to plan for if you do that? Have you thought about what you might do if your health surprisingly declines? What steps would you like your family to take? How involved do you want your family to be? How do I know aging in place is right for me? Will home modifications be necessary? Are you going to rely on your family members if you ever need them for care? Begin researching the quality of in-home care providers well advance in the need. Know which in-home care providers are more reputable, and even the local facilities that are nearby if needed. If no family members are nearby, who will make up the support network? Who will manage your needs for you? Somebody else needs to be involved in this process. What if staying in the home becomes impractical? What are some of the options locally? Is long-term care insurance already in place? Obviously, that can be a really big piece of the plan. If not, does a hybrid plan make sense; some type of accommodation, LTC annuity plan or something like that? Does it make sense to go ahead and secure a reverse mortgage? Doesn’t mean you have to tap into it, but go ahead and secure that line so it can be there, begin growing over time, possibly to be used in the future even to pay family caregivers. How do I know if a retirement community is right for me? How much does it cost? You need to choose an option you might prefer: an independent-plus community or a continuing care community and weigh the pros and cons of each. What is the plan if needs advance beyond what’s available in that retirement community? If you go to an independent-plus community and later need nursing care, is that a concern for you? What are some of the options there? Is long-term care insurance in place? If you’re going to move to a retirement community, it generally means selling the home, and that’s going to free up home equity that can be invested. Some portion of that can be used to cover the monthly fees, maybe for many years depending on how much equity is there. 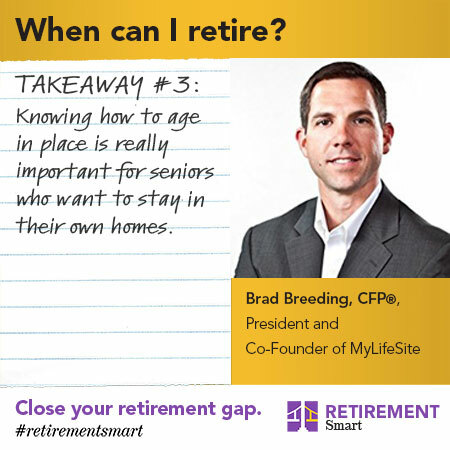 This Key Retirement Takeaway is excerpted from a recent webinar presented by Brad Breeding, CFP®, President and Co-Founder of MyLifeSite.net, and a nationally recognized expert speaker. If you find this topic helpful, register today for the next Retirement Smart Education Series from leading retirement experts, broadcasts beginning the first week of November! Register soon for the series of eight webinar broadcasts that begins the first week of November and runs thru the end of December. Programs will be broadcast Sundays thru Thursdays at 9 pm eastern. If you miss a broadcast webinar, you can view the recording when convenient. Webinars may be viewed on desktops, laptops, tablets and phones. You may replay programs when desired. As part of the broadcasts, you will receive a PDF of the slides for taking notes and an Action Plan per course to help capture your next steps. You will also receive a Certificate of Completion once we confirm you watched all the webinars in your package. We recommend that you then take your Certificate and Action Plans to your advisor or find one who can help you implement what you’ve identified as important to do or further explore to secure your retirement. The series of 9 webinars, including all pdf’s, Action Plan, and Certificate of Completion is available for $89. 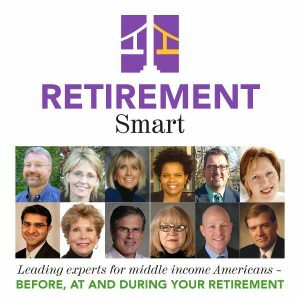 Never miss a new key retirement takeaway! Bookmark this page, or follow us on Instagram, Facebook, Twitter.